Our trusty team of Babyologist reviewers were excited to take this compact yet go-anywhere stroller out for a spin. Here’s the skinny on what they loved about this practical, design-led set of wheels. Before we get started, let us tell you that the GB Pockit Stroller actually took out the 2014 Guinness World Record for the most compact stroller, combining cutting-edge technology and innovative design in world-beating style. When folded, this stroller is the smallest and most compact package on the market, measuring just 300 x 180 x 350 mm, to be precise. It further confirms its fold-and-go status, weighing in at a tiny four kilos. Wait, what?! It’s totally true. Of course, busy mums and dads are loving this model, because it can literally be thrown in a bag and toted anywhere. It’s designed for it, in fact! Expertly built for children six months to four years old, the GB Pockit is a no-brainer, adaptable travel (or everyday!) option that will grow with your child. It’s hardly surprising that our team of expert parent reviewers sang its praises and said they’d heartily recommend it to everyone. Here’s what they most loved about this clever pram. The GB Pockit Stroller impressed our Babyologists with its versatility and adventurous nature. It managed a range of outings with ease and looked gorgeous whether it navigated cafe, park or trip away. “Local shopping centres, going for walks to our favourite playgrounds and quick little trips such as in and out to doctor’s appointments and that all important coffee date” were easily navigated, said Babyologist Melanie. Melanie was also pretty impressed with how simple the GB Pockit Stroller was to use. “Amazingly easy! Still blows me away how quick and easy it is to fold/ unfold!” Melanie told us. Mum Sahra said the stroller was perfect for those with a baby on the way. 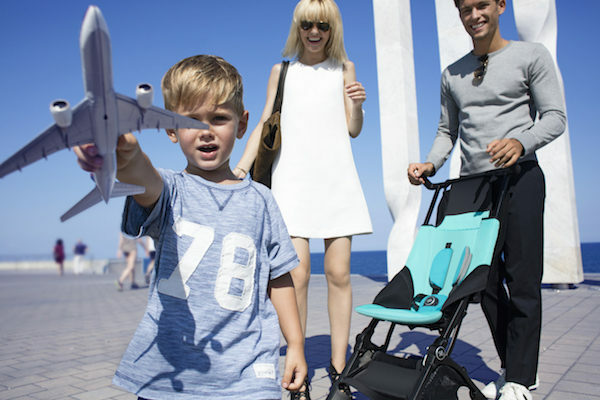 The stroller packs a whole bunch of benefits into one sweet package, making it extra popular with globe-trotting and road tripping parents. It fits neatly in the overhead locker on an aeroplane and tucks easily into the boot of even the smallest cars. “Being so lightweight and easy to open and close, the stroller is great to have in the car and take out for quick trips to the shop,” mum Michelle told Babyology. “The straps were easy to use and adjust, and the brake, wheel locks etc were all very simple and easy to use,” she said. “The stroller made travelling SO much easier. Given we drove recently for four nights at the beach, we would not have taken a stroller ordinarily in order to fit luggage. We could pop the stroller folded up behind the driver’s seat in the car perfectly,” Sahra explained. The GB Pockit keeps a firm focus on good looks, as well as parent-friendly design. It comes in a whole bunch of colours – two different shades of blue, pink, black, khaki and red and our mum-team thought it was super-contemporary and easy to maintain. Reviewers were also really impressed with the premium fabrication and quality build. “Appearance was great, modern looking and black which is easy to keep clean,” Babyology reviewer Meg said. “The stroller looks great! Very simple and stylish. We received the Sea Port Blue which is a great colour, and the range of colours available is good,” Michelle told us. “Great colour and very good quality material. Looks fantastic,” said Tracy. The stroller comes packed with features to ensure the comfort of parent and child. “As a small, lightweight stroller which is easy to use, the stroller is great. Being small enough to fit into hand luggage is a great feature. The stroller delivers on expectations, and is so easy to open and close. The stroller looks good and my daughter was quite happy in it – she looked comfortable and happy,” Michelle said.